Researchers from the University of Alicante Adhesion and Adhesive Lab and the Thorax Surgery Service from the Albacete University Hospital Complex have developed a new method for filling and sealing pleural cavities. The process consists of injecting polyurethane foams into the lungs with a self-expanding and self-modelling capacity that replaces aggressive surgical and palliative treatments currently used. This biocompatible material has very low risk of toxicity and can be easily applied through a small hole in the thorax. 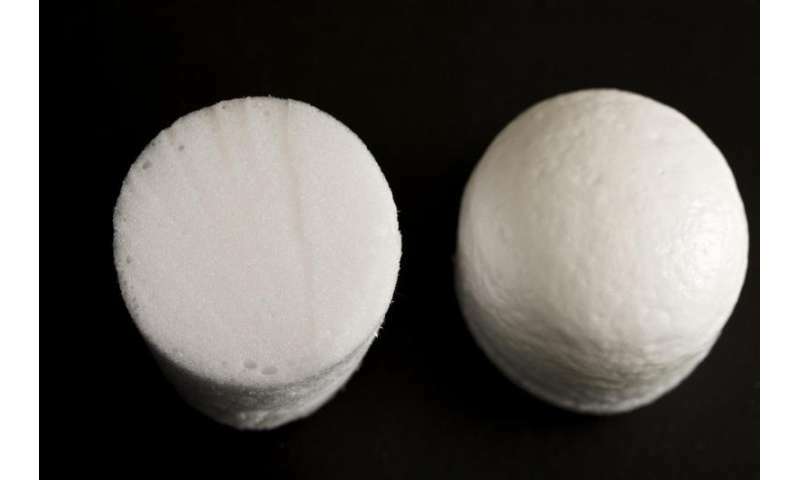 "Although there are different polyurethane foams for medical use, the innovative aspect of this method is that the foam is generated at the moment it is placed in the cavity, mixed with two liquid components," says Professor of Inorganic Chemistry José Miguel Martín Martínez and chemist Alfonso de Lucas, both from the Adhesion and Adhesive Lab. When injected into the patient, the material foams in contact with the damp walls of surrounding tissues and creates a very compact surface area that acts as a mold that fully fills the entire volume of the pleural cavity. Therefore, the polyurethane foam adapts to the entire gap and prevents further complications in lung patients such as infections, inflammation, bleeding, pain or fistulas, according to the researchers. The lightweight material does not adhere to the tissue walls, and thus prevents breakage problems if extraction is necessary. "As far as we know, there is no history of using polyurethane foams for filling the pleural cavity," José Miguel Martín says. There are several pathological processes by which the pleural cavity admits air or biological fluids such as pus or blood that are solved by simple drainage. However, especially after lung cancer surgery or severe lung infections, fluids can accumulate with bacteria that are difficult to eradicate even using antibiotics or drainage. At this point, patients suffer progressive deterioration, pain, fever, choking and even death if not treated in time. "The filling and sealing of the pleural cavity with polyurethane foam would avoid liquid retention and would not leave gaps for the development of bacteria, which means a definitive control of infection," says thoracic surgeon Dr. Carlos Rombolá. The treatments for the final sealing of chronic pleural cavities consist of aggressive interventions such as thoracic windows or pleural drainage. Since the beginning of the 20th century, researchers have tried unsuccessfully to fill chronic pleural cavities with air, oils, paraffin and silicones. Today, with innovative polyurethane foams with self-expanding and self-molding features, "we would avoid major surgeries with a single orifice and the mixing of two liquid substances," says José Miguel Martín.